What strikes you first about Chetan Bhagat’s novels is the fact that this author writes about Indians and for Indians. His characters are young, ambitious and passionate and have the same moral, social and religious dilemmas as many of the young Indians today. At the same time their context and sensibility too is unabashedly Indian. The new and the third Bhagat book, “The 3 mistakes of my life", has all these qualities. The setting is the city of Ahmedabad that though being urban is yet not as metropolitan as many of its metro counterparts. It retains its small town flavour in pols (colonies), traditional Indian households and small vegetarian eateries. 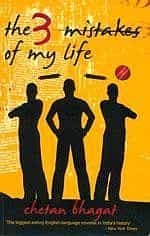 It has the protagonist Govind with his passion and acumen for accounts and business, it has Ishan for whom cricket is the element around which his life revolves and it has Omi, a priest’s son and loyal friend who is ready for anything that his friends are game for. What follows is a mix of cricket, religion, business, love and friendship. Govind sets up a sports shop along with his friends in the temple compound with Omi’s family’s help. The shop prospers as Ishan coaches young boys in cricket and Govind teaches maths to Ishan’s sister Vidya who also captures his heart. Ishan then meets Ali, a child master with a hyper reflex condition that makes him hit each ball for a six. Ali displays the talent which Ishan never had and Ali’s destiny becomes his own. Enter Omi’s Bitoo mama (maternal uncle), a communal party man bent on converting the young into fighters in the name of Hinduism. Situations come to a head and Ahmedabad burns in riot fires. Omi dies saving Ali and Ishan finds out about Vidya and Govind, a betrayal he does not forgive. These events lead Govind to his death-bed and that is when he writes the email to Bhagat. Perhaps, this is the biggest compliment an author can receive. Its not when New York Times describes him as the biggest selling English language author in the country or when he crosses the coveted two million book sales’ figure, but when someone chooses to remember him in his last minutes, that makes a writer go beyond the ordinary. After all, isn’t the purpose of all writing is to touch someone’s heart? “The 3 mistakes of my life" is written simply and has the quality that makes one want to read the book cover to cover in one sitting. The pricing of the book is just right for the target audience - young people. This book like Bhagat’s earlier one, “One night @ call centre, too has the masala, emotion and pace to turn into a potential blockbuster.